Nationalize money, not banks - Ons Geld | Maak ons geld stabiel, dienstbaar en democratisch. Is there not a better away? Yes, there is. We need not go back to the gold standard. 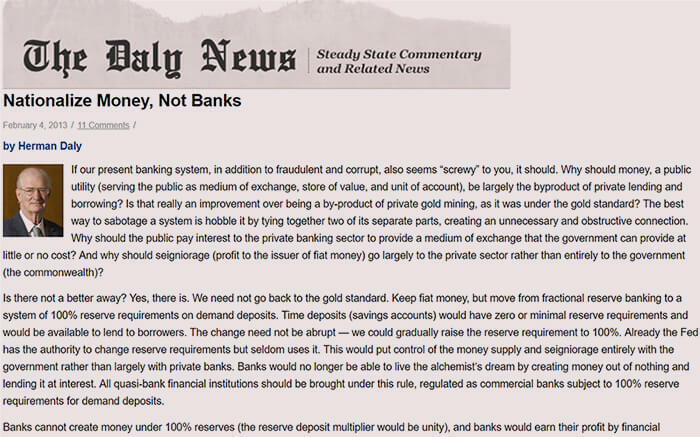 Keep fiat money, but move from fractional reserve banking to a system of 100% reserve requirements on demand deposits. Time deposits (savings accounts) would have zero or minimal reserve requirements and would be available to lend to borrowers. The change need not be abrupt — we could gradually raise the reserve requirement to 100%. Already the Fed has the authority to change reserve requirements but seldom uses it. This would put control of the money supply and seigniorage entirely with the government rather than largely with private banks. Banks would no longer be able to live the alchemist’s dream by creating money out of nothing and lending it at interest. All quasi-bank financial institutions should be brought under this rule, regulated as commercial banks subject to 100% reserve requirements for demand deposits. Banks cannot create money under 100% reserves (the reserve deposit multiplier would be unity), and banks would earn their profit by financial intermediation only, lending savers’ money for them (charging a loan rate higher than the rate paid to savings or “time-account” depositors) and charging for checking, safekeeping, and other services. With 100% reserves every dollar loaned to a borrower would be a dollar previously saved by a time account depositor (and not available to the depositor during the period of the loan), thereby re-establishing the classical balance between abstinence and investment. With credit limited by saving (abstinence from consumption) there will be less lending and borrowing and it will be done more carefully — no more easy credit to finance the leveraged purchase of “assets” that are nothing but bets on dodgy debts. Why are private banks controlling this public utility? To make up for the decline and eventual elimination of bank-created, interest-bearing money, the government can pay some of its expenses by issuing more non interest-bearing fiat money. However, it can only do this up to a strict limit imposed by inflation. If the government issues more money than the public voluntarily wants to hold, the public will trade it for goods, driving the price level up. As soon as the price index begins to rise the government must print less and tax more. Thus a policy of maintaining a constant price index would govern the internal value of the dollar. The United States opposed Keynes’ plan at Bretton Woods precisely because under it the dollar would not function as the world’s reserve currency, and the U.S. would lose the enormous international subsidy that results from all countries having to hold large transaction balances in dollars. The payments union would settle trade balances multilaterally. Each country would have a net trade balance with the rest of the world (with the payments union) in bancor units. Any country running a persistent deficit would be charged a penalty, and if continued would have its currency devalued relative to the bancor. But persistent surplus countries would also be charged a penalty, and if the surplus persisted their currency would suffer an appreciation relative to the bancor. The goal is balanced trade, and both surplus and deficit nations would be expected to take measures to bring their trade into balance. With trade in near balance there would be little need for a world reserve currency, and what need there was could be met by the bancor. Freely fluctuating exchange rates would also in theory keep trade balanced and reduce or eliminate the need for a world reserve currency. Which system would be better is a complicated issue not pursued here. In either case the IMF could be abolished since there would be little need for financing trade imbalances (the IMF’s main purpose) in a regime whose goal is to eliminate trade imbalances. Returning to domestic institutions, the Treasury would replace the Fed (which is owned by and operated in the interests of the commercial banks). The interest rate would no longer be a target policy variable, but rather left to market forces. The target variables of the Treasury would be the money supply and the price index. The treasury would print and spend into circulation for public purposes as much money as the public voluntarily wants to hold. When the price index begins to rise it must cease printing money and finance any additional public expenditures by taxing or borrowing from the public (not from itself). The policy of maintaining a constant price index effectively gives the fiat currency the “backing” of the basket of commodities in the price index. In the 1920s the leading academic economists, Frank Knight of Chicago and Irving Fisher of Yale, along with others including underground economist and Nobel Laureate in Chemistry, Frederick Soddy, strongly advocated a policy of 100% reserves for commercial banks. Why did this suggestion for financial reform disappear from discussion? The best answer I have found is that the Great Depression and subsequent Keynesian emphasis on growth swept it aside, because limiting lending (borrowing) to actual savings (a key feature of 100% reserves) was considered too restrictive on growth, which had become the big panacea. Saving more, even with the intent to invest more, would require reduced present consumption, and that too has been deemed an unacceptable drag on growth. As long as growth is the summum bonum then we will find ways to borrow against future wealth in order to finance the present investment needed to maximize growth. Why would full reserve banking not crash on the rock of the growth obsession again, as it did before? One answer is that we might recognize that aggregate growth today increases unmeasured illth faster than measured wealth, thereby becoming uneconomic growth. How can loans be repaid out of the net illth they generate? Should we not welcome full reserve banking as a needed financial restraint on growth (uneconomic growth)? Another answer is that, thanks to financial meltdowns, the commercial banks’ private creation of money by lending it at interest has now become more obvious and odious to the public. More than in the 1930s, fractional reserve banking has become a clear and present danger, as well as a massive subsidy to commercial banks. Real growth has encountered the biophysical and social limits of a full world. Financial growth is being stimulated ever more in the hope that it will pull real growth behind it, but it is in fact pushing uneconomic growth — net growth of illth. Quantitative easing of the money supply does nothing to counteract the quantitative tightening of resource limits on the growth of the real economy. The original 100% reserve proponents mentioned above were in favor of aggregate growth, but wanted it to be steady growth in wealth, not speculative boom and bust cycles. One need not advocate a steady-state economy to favor 100% reserves, but if one does favor a steady state then the attractions of 100% reserves are increased. Soddy was especially cautious about uncontrolled physical growth, but his main concern was with the symbolic financial system and its disconnect from the real system that it was supposed to symbolize. As he put it: “You cannot permanently pit an absurd human convention, such as the spontaneous increment of debt [compound interest], against the natural law of the spontaneous decrement of wealth [entropy].” Wealth has a physical dimension and is subject to physical limits; debt is a purely mathematical quantity and is unlimited. How would the 100% reserve system serve the steady-state economy? First, as just mentioned it would restrict borrowing for new investment to existing savings, greatly reducing speculative growth ventures — for example the leveraging of stock purchases with huge amounts of borrowed money (created by banks ex nihilorather than saved out of past earnings) would be severely limited. Down payment on houses would be much higher, and consumer credit would be greatly diminished. Credit cards would become debit cards. Long term lending would have to be financed by long term time deposits, or by carefully sequenced rolling over of shorter term deposits. Equity financing would increase relative to debt financing. Growth economists will scream, but a steady-state economy does not aim to grow, for the very good reason that aggregate growth has become uneconomic. Second, the money supply no longer has to be renewed by new loans as old loans are repaid. A continuing stream of new loans requires that borrowers expect to invest in a project that will grow at a rate greater than the rate of interest. Unless that expectation is sustained by growth, they will not borrow, and in a fractional reserve system the money supply will shrink. With 100% reserves a constant money supply is neutral with respect to growth; with fractional reserves a constant money supply imparts a growth bias to the economy. Third, the financial sector will no longer be able to capture such a large share of the nation’s profits (around 40%! ), freeing some smart people for more productive, less parasitic, activity. Fourth, the money supply would no longer expand during a boom, when banks like to loan lots of money, and contract during a recession, when banks try to collect outstanding debts, thereby reinforcing the cyclical tendency of the economy. Fifth, with 100% reserves there is no danger of a run on a bank leading to a cascading collapse of the credit pyramid, and the FDIC could be abolished, along with its consequent moral hazard. The danger of collapse of the whole payment system due to the failure of one or two “too big to fail” banks would be eliminated. Congress then could not be frightened into giving huge bailouts to some banks to avoid the “contagion” of failure because the money supply is no longer controlled by the private banks. Any given bank could fail by making imprudent loans in excess of its capital reserves (as opposed to demand deposit reserves), but its failure, even if a large bank, would not disrupt the public utility function of money. The club that the banks used to beat Congress into giving bailouts would have been taken away. Sixth, the explicit policy of a constant price index would reduce fears of inflation and the resultant quest to accumulate more as a protection against inflation. Also it in effect provides a multi-commodity backing to our fiat money. To dismiss such sound policies as “extreme” in the face of the repeatedly demonstrated colossal fraudulence of our current financial system is quite absurd. The idea is not to nationalize banks, but to nationalize money, which is a natural public utility in the first place. The fact that this idea is hardly discussed today, in spite of its distinguished intellectual ancestry and common sense, is testimony to the power of vested interests over good ideas. It is also testimony to the veto power that our growth fetish exercises over the thinking of economists today. 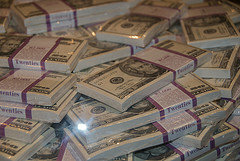 Money, like fire and the wheel, is a basic invention without which the modern world is unthinkable. But today out-of-control money is threatening to “burn and run over” more people than both out-of-control fires and wheels.